Earlier this month, I shared my new “healthier habit” of cooking, baking, eating, and grinding my own whole grains every day. I received SO much positive feedback from that post — honestly, I’m shocked at how many of you are also grinding your own grains to make delicious breads and baked goods! That said, I know from my own personal experience that if you are not the type to get excited about cooking or baking, or if you really couldn’t care less about grinding grain, that post probably seemed WAY over-the-top and not very doable for the average family. Honestly, if I had read about someone grinding grain 3 years ago, I would have immediately clicked away thinking the whole grain lifestyle was not for me or my “normal” family. HOWEVER, eating whole grains does NOT have to be complicated, confusing, time-consuming, or stressful… today’s recipe for homemade oatmeal proves I’m right! Did you know oats are a “whole grain”? Yup, they are — and a really nutritious one at that. Oats are fairly low-calorie, packed with protein, fiber, and healthy fats, and they’ve been shown to lower LDL cholesterol (the “bad” cholesterol). Oats themselves are gluten-free; however, if you’re very sensitive to gluten, you’ll need to make sure your oats are labeled as “gluten-free” as they are often processed in factories with wheat. Oats are also extremely frugal and readily available at any grocery store. Our family enjoys an “oatmeal buffet” with lots of yummy toppings roughly once a week — usually served with smoothies, fresh fruit, and muffins or quick bread. Since oatmeal is a whole grain, you’re not losing any of the nutrients; and as a result, you’ll most likely feel full until lunch! This “recipe” is so ridiculously simple, I almost feel silly sharing it as a full-length blog post. 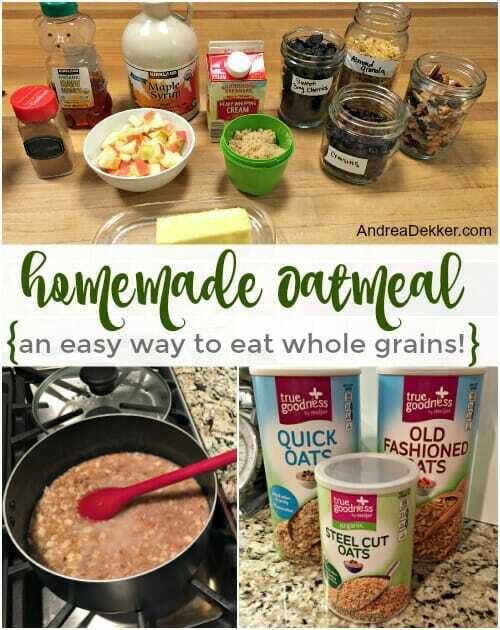 However, since my goal is to cook, bake, and consume whole grains every day, I couldn’t resist the chance to share one of the easiest ways I’ve found to eat more whole grains! Oh, and feel free to double or triple the recipe to feed a crowd! NOTE: If you want to get really adventurous, try using a 7 Grain Cereal Mix in place of the oats. It’s the same simple “recipe” just with more whole grains! In a medium sauce pan, bring water and salt to a boil. Add oats, reduce heat to medium-low, and simmer for 5 minutes, stirring regularly. Remove from heat, cover, and let steam for an additional 2-3 minutes. Scoop into bowls, add optional toppings, and enjoy. NOTE: Quick Oats will obviously cook faster. Steel Cut Oats will take longer — both are great substitutions for Old Fashioned Oats. Just follow the instructions on the back of the containers for altered cooking times. I love that I can make ONE meal and allow everyone to customize it to their tastes with a variety of toppings. Want to eat MORE oats? That looks so delicious and amazing. Your post about grinding your own grains is my all-time favorite post! I kept thinking I would comment on it, but never did. I am in a crazy, busy phase where both of my children play three sports per year and we are gone to games and events ALL THE TIME. However, one day I will grind my own grains! My husband and I eat old fashioned oats loaded with fruit at least 5 days per week. My very favorite concoction is cooked cranberries, fresh apples, and pecans. Tastes just like a cranberry crisp! Thanks for the recipe — and for finally sharing your comment! Yes, I definitely remember when my sisters and I were all playing 3 sports per year and my parents were gone all the time. I’m secretively dreading the time our kids get so involved as I don’t want to be gone all the time — but I have a feeling we’ll enjoy it more when we get to watch our kids play/perform/etc. 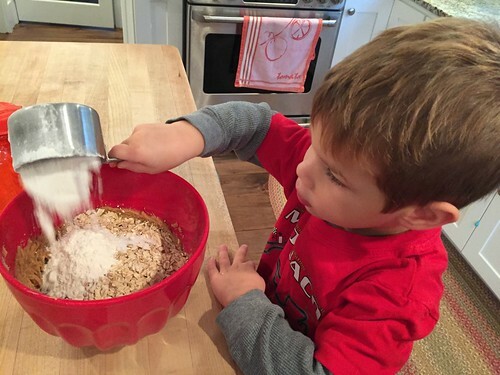 My boy eats oatmeal nearly every morning but I have never made it on the stove! I put a 1/2 cup in a bowl, add water, cinnamon, brown sugar and microwave for 3 minutes at 60% (or whatever works in your microwave). I add applesauce and milk after it comes out to cool it a bit. the stove is SOOOOOOO much faster if you’re making oatmeal for more than one person. Plus, it stays hotter longer. If your microwave method works well for you though… keep doing it! 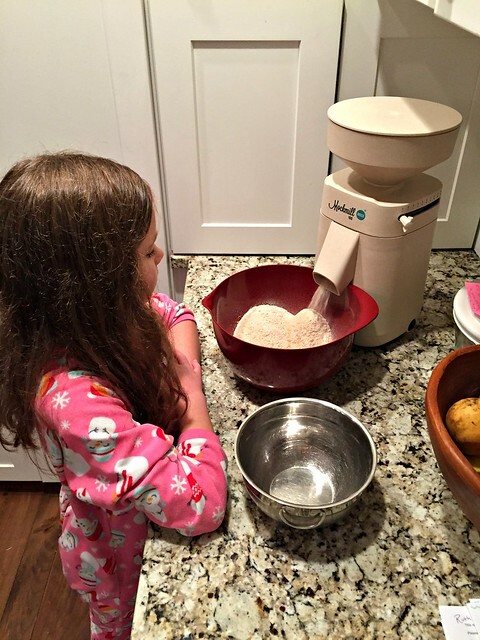 You can make the whole family’s oatmeal in the microwave at once! Just use a larger bowl! I do 3 cups oats, 3 cups milk, 3 T brown sugar, and 1 T cinnamon. The stovetop and microwave take the same time; I do the microwave because it doesn’t take any tending/stirring so I can make our smoothies while the microwave is running. Also, I make “oatmeal packets” (family size, using dry ingredients listed above, in a quart baggie) in bulk and store them in my pantry. So all I have to do in the morning is dump the contents into a large bowl and add milk and pop it in the microwave. Super quick and easy! I have little glass bowls with lids. I fill 4-5 of them up once a week with steel cut oats so my family can microwave them independently in the morning. We usually top them with brown sugar butter or chocolate chips. My favorite is like a Reece’s peanut butter cup. I just swirl a tablespoon of peanut butter in mine and top with a tablespoon of mini chocolate chips. By dinner I’m looking forward to breakfast! this is a clever idea — one less thing for you to do in the morning! That recipe looks fantastic!!! I am so happy my super picky 10 year old has finally fell in love with oatmeal. I really would love to try grinding my own grains. Andrea, I am so thankful you are posting about grains. 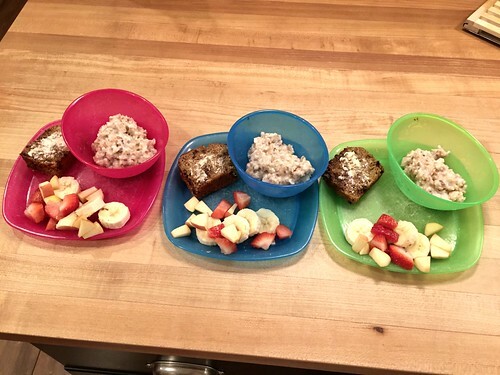 yes, oatmeal is such a nutritious meal for kids too — glad your picky eater will tolerate it! I like making 2 servings of oatmeal in the microwave. I cut up an apple (leaving peel on), sprinkle some apple pie spice or cinnamon on it and microwave for ~3 minutes until apple leaves soften. Then I add it oats and water/milk and microwave for another 3 minutes. The apples provide some natural sweetness and texture. I also do a breakfast using plain or lightly sweetened yogurt, oats and fresh fruit. It’s best if you is it the night before because the oats soften with time. (I have eaten it without letting the oats soften and it is fine, just a different texture). I throw in whatever fresh or frozen fruit I have. I like chopped up raw apples with cinnamon. Berries (fresh or frozen) work well and you can add a little banana too. It makes a great portable breakfast. sounds yummy! thanks for all the simple ideas! 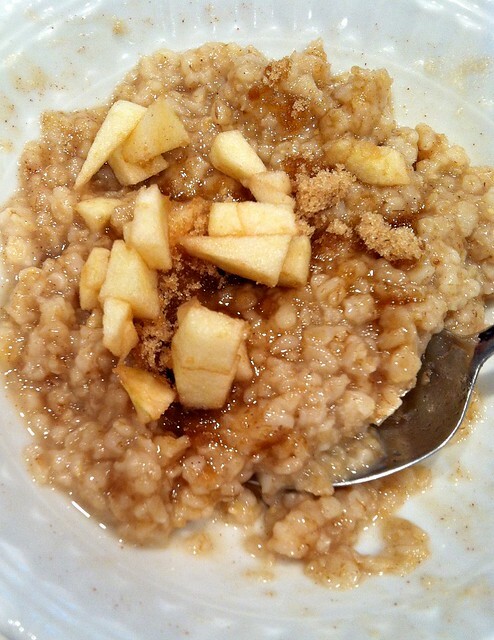 Steel cut oats can be just as quick as rolled if you soak them overnight. 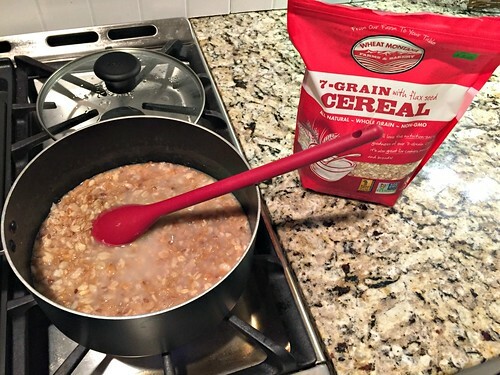 Put the right amount of oat and water in a pan and leave on the stove overnight. In the morning, just turn on the burner and cook for five minutes while you get the rest of breakfast ready or pack a lunch. yup, I often soak mine overnight too. I use steel cut for all my grain grinding, but our family simply prefers the texture of rolled oats versus steel cut — and as far as I know, the nutritional value is the same. 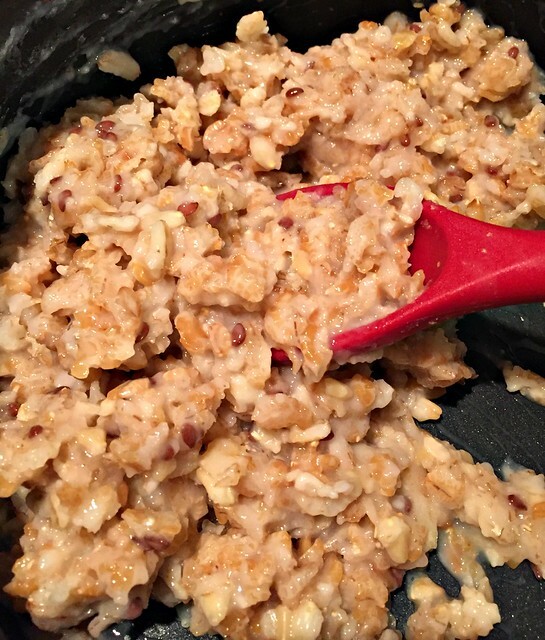 I make steel cut oatmeal overnight in my small crock pot. I make enough to last for the week. I love adding canned pumpkin and cinnamon while it cooks. Or a little canned coconut milk with mango as a topper. Or sometimes I simply top it with blueberries and walnuts. Yes I keep a container full of your instant oatmeal recipe in our house alllllll the time. It’s the best! We all love it! I will have to do the variety of sides on the weekend for a special treat!! Thanks again Andrea!!!! Boil water. Add oats. Cover. Turn off the burner. Also boiling a large pot of water and holding the oats in a metal strainer (the oats boil more freely) makes a really nice texture as well. I have not thought of making extra servings for the next day. I may try it! I made your homemade instant oatmeal in a big container and LOVE it! Its so easy and I can make it to my liking! I just boil water in a kettle instead of microwaving. 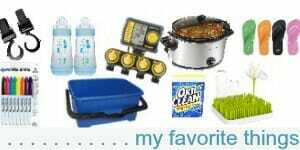 A GREAT money saver too! Thank you! Mmmmm, I love steel cut oats with berries, bananas, apple and nuts. I used make up four servings, eat one and package the remainder in three one-cup servings in the fridge. They are so easy to take to work and are quite filling. Thanks for the reminder…I’m going to make some tomorrow! Slivered almonds gives a nice crunch, too. Andrea and all, I’m not sure it’s OK to do this………..but I’m totally just a VERY satisfied customer and want to mention that I buy my oats in a 50 pound sack from http://store.honeyvillegrain.com/ for about $1.00 a pound plus $4.49 shipping. 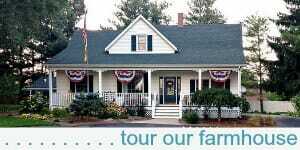 Very reliable and fast, and Honeyville oats are wonderful! 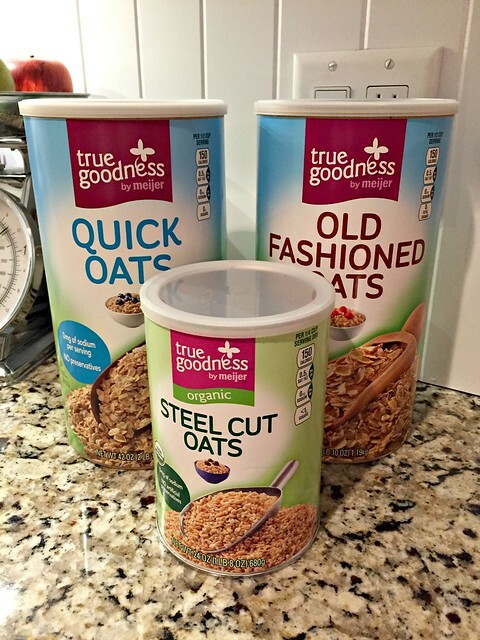 I get steel cut oats because we love the thicker texture. It’s a little shocking the first time you see a 50 pound sack of oats, but I’ll tell you how I deal with that.Two important one-time purchases make cheap, delicious oatmeal easy! When your buckets have their gamma seal lids hammered on and your 50 pound bag of oats arrives, just lay the packing box flat on the porch–it’s so heavy, and it’s not necessary to drag it indoors. Open the flat side of the packing box and leave the bag of oats inside the box. Then use a knife to cut like a 12″ square hole into the side of the bag to give you access to the oats, and use a big dry container of some sort (I used a big yogurt container) to scoop the oats into the buckets. I use this storage system for lots of things that I buy in bulk, like sugar, organic pasta from Italy, pet food, etc. Works great, and the only small problem is where to put the buckets. Bedroom corner works for me! Looks good! As the weather begins to cool, oatmeal is a great comfort food. With my third child, I would eat a bowl of oatmeal and a banana almost everyday for breakfast. It was a filling breakfast that gave me energy for my morning walk. Hope your pregnancy continues to go well! I love a good bowl of oatmeal for breakfast, too! I usually add chia or ground flax while it cooks to add some healthy omega 3’s. You can also do this basic recipe using quinoa, too–I love it for breakfast with cinnamon, raisins, & a little brown sugar! I do the same with chia, ground flax, or even ground hemp seeds (found at Costco). I use almond milk & it’s really good with the oatmeal! 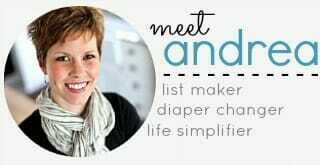 With my last pregnancy and this one, I have had a bowl of oatmeal with a dash of sugar and a couple hearty tablespoons of peanut butter almost every day. Even after I had my baby, I was eating this. It really gives me a boost for the day. YUM! I love the idea of making enough for a crowd. That will be handy the next time we have guests. Andrea, this looks amazing! I’m always throwing things into a pot to see what I come up with. I will have to try this recipe. I love oatmeal. My favorite breakfast recipe for a crowd is the slow cooker breakfast casserole (meats, hash-browns, cheese, eggs, onion, dill, salt and pepper, milk) because it’s so amazing to wake up to! My coworkers love it. I always brought it in when I worked Saturdays during our busy season. You should be able to find all kinds of recipes on Pinterest but I love the one with dill! We always add frozen wild blueberries and maple syrup to ours, when I add frozen berries it cools it off faster on school mornings! This looks good, I will have to make some right now! 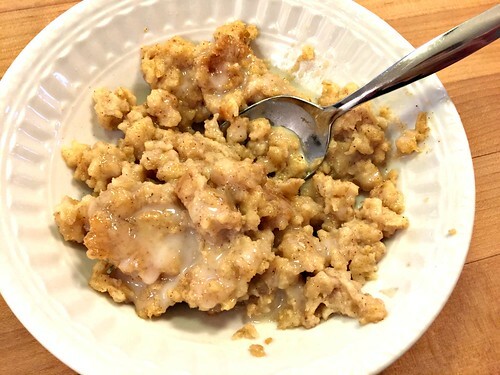 I love oatmeal–it’s my go-to breakfast lots of times. I make a batch of steel-cut oats with almond milk and eat it all week. That looks yummy! Did you have leftovers? And if so, do they refrigerate well? I ask because if I was going to make a batch, I would want to make enough to last me the whole week so I could heat up a bowl of it every morning before I go to work. I think oatmeal definitely keeps you fuller longer than any cereal ever could…this is probably why you guys were able to stay full until lunch! Kimberley, that’s exactly what I do! I use a big soup pot to cook up a week’s worth of oatmeal for two of us. It works perfectly! I leave it in the pot in its dedicated spot in the fridge, and it’s very, very simple to pull out that pot and “cook” breakfast with my eyes still closed every morning. LOL Just be sure to keep the pot covered so the oatmeal doesn’t dry out. If you do that, you can just scoop out what you want and microwave it and you’re good! OK, I don’t usually eat the “savory” toppings at breakfast, but they make a super simple lunch or supper, that’s for sure! I only recently heard about is EXISTENCE – we have rolled oats in RSA. I’d definitely try out your various toppings. 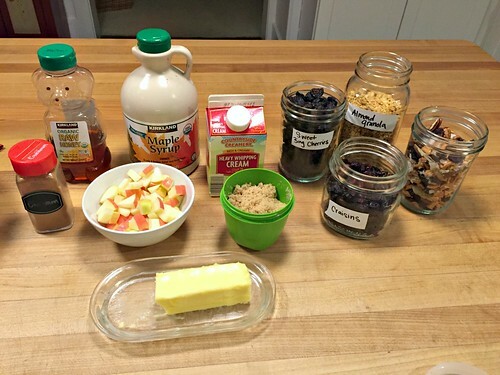 Prepare mine with a bit of milk, to make it creamer…took me 40 yrs to learn to eat oats! I’ve used both Steel cut and “roaled oats” — both work fine. I didn’t like oatmeal much because when I was young, we had those little packets of weird flavors. Later when I tried the rolled oats made with milk, I loved them! And steel-cut are even better! I get all my oats from Aldi. I cook them usung all milk or half milk/half water to get a little more calcium and stuff! Oh, thanks! So, middle of summer! Writing from 20 degrees below zero! I also nou do overnight oats – I soak my individual portion of oats in juice or milk, add, plain, full-fat yoghurt in the morning with various cut fruits, nuts & granola. Another favourite is to soak i milk, then in the morning: microwave for 1 min, blitz a banana through the microwave in 30sec, add to oats, add 1 teaspoon peanutbutter plus good dose of cacao powder…oh my heaven! 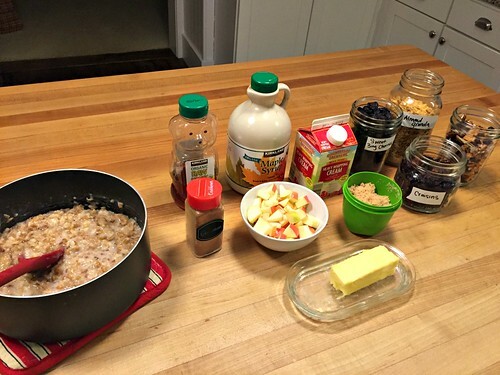 I’ve done overnight oats too — I REALLY like them!